My name is Stevi. I play a cocktail ingenue on the intarwebz. I try to educate my friends about the glories of gin and cocktails that actually taste a little bit like the alcohol that’s in them. But I have a deep dark secret, one I will finally share for this month’s Mixology Monday, Guilty Pleasures. I like cocktails that taste like candy. There. I said it. It’s out. Whew. I feel better. The one candy I particularly like, both in candy form and drink form, is the Lemon Drop. The sweet tart combination is a oldie but goodie. Never mind that when I order them in bars, it’s either too sweet or too tart. I have in my mind the Platonic ideal of the Lemon Drop cocktail. 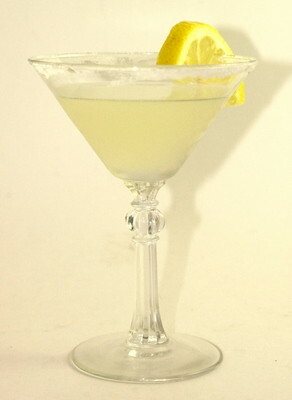 In fact, it was the Lemon Drop that helped me learn the perils of premixes. I wanted to make some at home, and saw a bottle of Rose’s Cocktail Infusions Lemon Drop mix, and thought, hey, that would be awesomely simple. I bought a bottle of vodka, went home, and gave it a try. It was a disaster. The taste was just so incredibly chemical and unpleasant. It may be the first time I poured a drink down the drain. It appears my impression isn’t so unusual, because I don’t see mention of that particular flavor anywhere. Having learned my lesson, for this MxMo, I thought I might make my own Lemon Drop, mixologist style. One thing I discovered searching through recipes is that the first decision to make is about the vodka. To use citrus infused, or to not? Being the sort of person I am, I thought I’d try both. My first attempt was with a citrus infused vodka. I found this version slightly too tart to my taste, although I think I was also reacting to the slight chemical nature I found in the Smirnoff citrus I used. I decided that for the straight vodka recipe I’d also try a variation that uses Cointreau as well, thinking it might better balance the lemon’s bitterness. I initially thought the additional teaspoon of simple would be overkill, but it actually is necessary here. The Cointreau brings an extra depth and balance to this mix. I far prefer this take on the Lemon Drop. Thank you, cocktail blog readers, for letting me get this secret off my chest. And please come back tomorrow to see the full roundup of Mixology Monday Guilty Pleasures! Stevi- Sounds easy and sinfully delicious. Glad you included the simple syrup. And using Sobieski is ideal. It is smooth and inexpensive. A perfect combination. Cheers! if you want to feel really guilty, replace the simple syrup with some Torani raspberry syrup to get the raspberry lemon drop (served at quite a few large chain restaurants – restaurants that slather things in nacho cheese sauce). I once oft-enjoyed Lemon Drops. They can be so finicky. Sometimes too sour, others too sweet. OK, confession…I have yet to find a lemon drop that I consider too sweet. I figure if I’m drinking drink rimmed with sugar, it should be sweeter than all getout.